We spread holiday cheer. We have a busy workshop. We deliver to peoples’ homes. Royer’s has more than a little in common with Santa, and we like to show off our version of the North Pole. That’s why we have a standing offer for the news media to visit our central design department in Lebanon and our stores to capture a flavor of the season. Within hours of the Daily News visiting, so, too, did WFMZ-TV/Channel 69 from Berks County. The TV station toured central design and interviewed our store managers in Lebanon, Erica Bixby (photo, top), and Reading, Amy Michalski, for their takes on the busy holiday season. 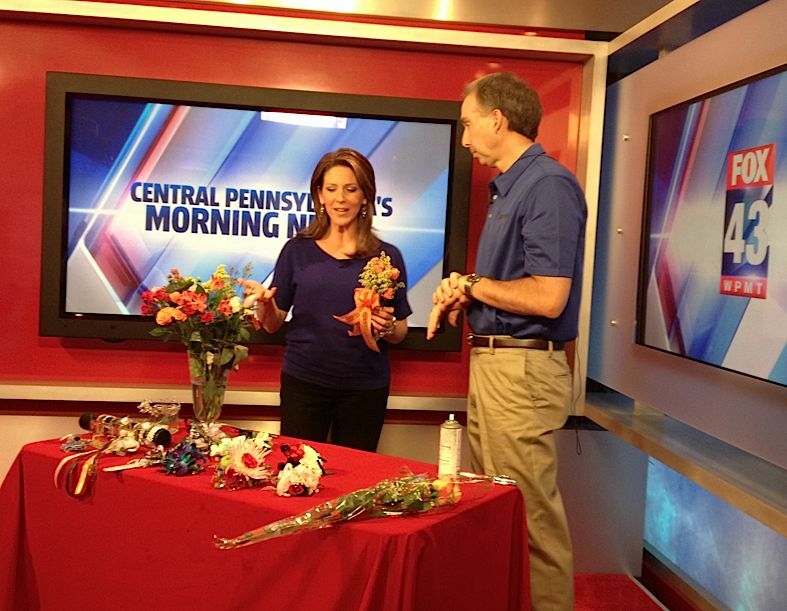 Erica Bixby, our store manager in Hershey, brought along a prom primer for her latest appearance on Fox 43 Morning News. Joining Melanie Orlins of Fox 43, Erica said “bling is in” for this prom season. Erica shared an array of bracelet options to which a corsage can be attached. “These are great keepsakes,” Erica said of the bracelets. She suggested rhinestones and ribbons as nice complements to the bracelets. As for flowers, orchids and roses are traditional favorites; this year, succulents are popular. What was an Allentown-based TV news station that has a Berks County edition doing at Royer’s corporate complex in Lebanon? Seeing how merry is made, that’s what. WFMZ-TV’s 69 News sent reporter Karin Mallett and photographer Patrick Manwiller to Royer’s as part of the station’s weekly “One Tank Trip” series. Royer’s has three Berks County stores, in Reading, Shillington and Wernersville. Tom Royer, one of Royer’s third-generation family owners, showed his guests the Lebanon operations, which include the company’s flagship store, distribution center, greenhouses, and central design department. Karissa Shatzer of abc27 is live with Barry Spengler, Royer’s vice president of operations. Having completed three live segments and starting her fourth, abc27’s Karissa Shatzer knew a lot more about Mother’s Day flower options than when she began. What she didn’t know was which one(s) she liked best. “Well, after this, it might be even harder to choose because there’s so much here,” she told viewers. Shatzer interviewed Barry Spengler, Royer’s vice president of operations, at our Camp Hill store on May 4, 2015. Barry Spengler, Royer’s vice president of operations, is a regular contributor to Fox 43 Morning News. 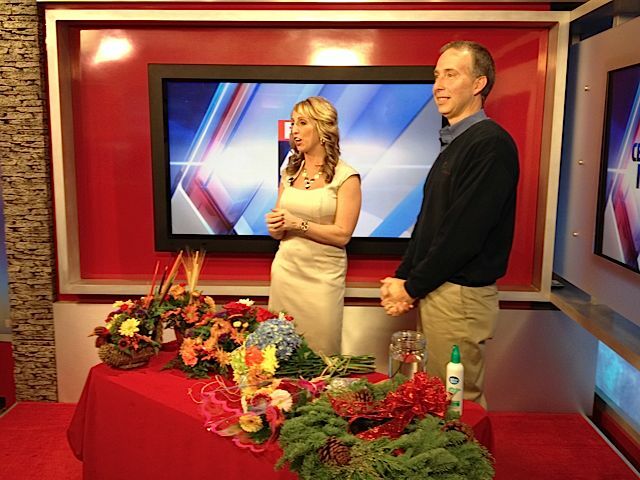 For his final visit of 2014 to the station’s York studio, he brought with him poinsettias, a carnation snowman and other symbols of the holiday season. You can view the entire segment by clicking here. Meanwhile, here are some behind-the-scenes photos from before, during and after the appearance. Barry Spengler with Fox 43 Morning News’ Amanda McCall. Before his latest appearance on Fox 43, Barry Spengler stopped at a drugstore for a bottle of hairspray. It wasn’t an act of vanity. Rather, Barry brought it to the TV studio as a prop for his visit with Fox 43’s Amanda McCall. Barry brought two centerpieces, including a small one made in a wicker basket that looked like a turkey and a larger one to show how simple it is to convert from Thanksgiving to Christmas use. If you’re visiting for Thanksgiving, Barry recommended loose flowers as a hostess gift. If you’re the recipient of loose flowers, Barry suggested creating a tape grid — essentially an X across the opening of your vase — to support the flowers. As for the hairspray, it’s Barry’s not-so-secret tip for making Christmas wreaths last longer. It acts like glue to hold the wreath together and gives it a nice sheen. You might say that Fox 43 Morning News carved out some time to talk about Halloween and, more so, Royer’s annual children’s book drive. 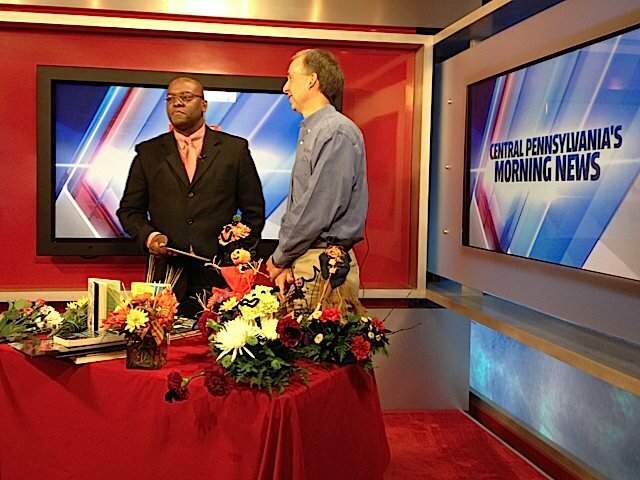 Barry Spengler, Royer’s vice president of operations, joined host Chris Garrett to discuss “Bouquets for Books,” which returns for its ninth year Nov. 1-8. In its first eight years, the book drive collected more than 12,400 new children’s books for area public libraries. Customers who donate a new children’s book will receive a free bouquet, up to three per family per visit. Barry explained that the book drive kicks off Saturday with a Royer’s Kids Club event, open to ages 5 to 12 in all stores. 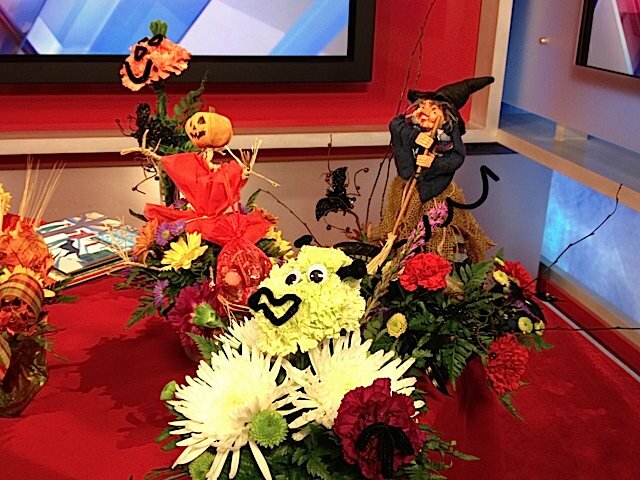 Barry also showcased an assortment of Halloween arrangements. 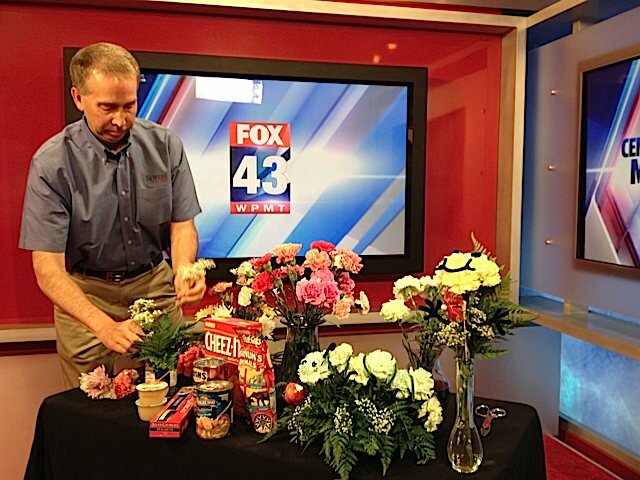 Barry Spengler, Royer’s vice president of operations, prepares for his live appearance on Fox 43 Morning News to talk about Royer’s annual food drive, Royer’s Stems Hunger, and to offer some tips on things children can do with flowers this summer. It’s summertime and the living is easy, the song lyric goes. But life isn’t easy if there isn’t enough food to eat at home. Royer’s annual food drive — Royer’s Stems Hunger — began in 2011 as a way to address some of that need. The food drive, which this year runs June 20-28, benefits the Central Pennsylvania Food Bank and the Greater Berks Food Bank. Barry Spengler, Royer’s vice president of operations, visited Fox 43 Morning News today to explain how Royer’s Stems Hunger works. It’s pretty simple: give a nonperishable food item, get a free carnation (up to six per family per visit). Barry told Fox 43’s Amanda McCall that food donations are welcome no matter the quantity. To help kick off the food drive, the Royer’s Kids Club is holding a free event on Saturday. Participants ages 5 to 12 will get to make an arrangement — in an empty food can. Call your nearest Royer’s to register; time slots are available at 10 a.m., 2 p.m. and 3 p.m.
Barry showed off some other projects that children can make with flowers at home this summer.